Also, identify the reading you would expect the ohmmeter to indicate if the light bulb were burnt out (failed öpen"). Unlike voltmeters or ammeters, ohmmeters must contain their own power sources. An implication of this fact is that ohmmeters must never be used to measure the resistance of an energized component. Discuss this important caveat with your students, being sure to ask them to explain why connecting an ohmmeter to an energized component might give erroneous measurements (if it doesn't destroy the meter first!). In regard to the ohmmeter reading for an open bulb, I have found that many math-weak students have a difficult time grasping the differentiating zero from infinity. They recognize both as being extreme conditions (nothing versus everything), but many make the mistake of regarding ïnfinity" as identical to zero. Quite to the contrary, ïnfinity" means bigger than big, and huger than huge. Do not be surprised if one or more of your students harbor this same misconception, and be ready to address it! What would be wrong about measuring the resistance of a light bulb while it is being powered by a battery? 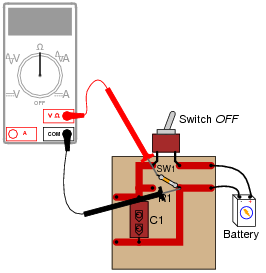 The voltage impressed across the light bulb by the battery will interfere with the ohmmeter's measurement. This principle is very easy to illustrate, simply by building a "live" circuit and trying to measure the resistance of a known component in that circuit, while energized. Different ohmmeters will, of course, respond differently to this abuse, but none will yield the proper value for that component's resistance. Now, we know we cannot simply connect an ohmmeter to an energized circuit, so how is it possible to obtain the resistance measurement we desire? Measure voltage across the light bulb, and current through the light bulb, and then use Ohm's Law to calculate filament resistance from these measurements. Challenge question: explain how it would be possible to make these measurements without de-energizing the light bulb (not even once!). Quite often, resistance measurements on a component are not practical because the component cannot be "powered down," or perhaps because the component's resistance is different when energized versus when de-energized (incandescent light bulbs being an excellent example of this). Knowing how to derive a resistance measurement from voltage and current measurements is a valuable skill. 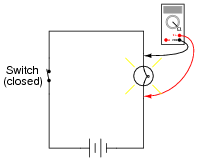 The "challenge" question, to measure light bulb voltage and current without breaking the circuit, is also very practical. Once students figure out how to do this (no, using an inductive ammeter is not an acceptable answer! 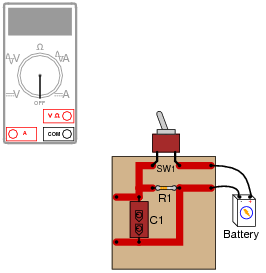 ), it would be a great classroom activity to actually build such a circuit and have students practice the technique on it. R5 is not the only component whose resistance is being measured! Follow-up question: what components on this printed circuit board may be measured with the ohmmeter without error? This is very important for students to understand: the fact that the resistance of an individual component cannot be measured in a circuit, unless it is guaranteed that the ohmmeter's measuring current passes through that component only. It is very important that students understand component resistance cannot be measured when the component is energized! 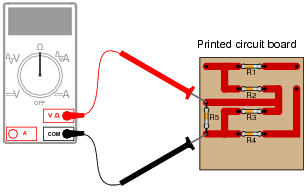 In cases such as this, it is necessary to disconnect the component from the rest of the circuit so that only its resistance (and not any other components' resistance) is measured. In other cases, though, it may be acceptable to leave the component in place to take a resistance measurement. Having forgotten the resistor color code, and being too lazy to research the color code in a book, the technician decides to simply measure its resistance with an ohmmeter. The value this technician obtains is 0.6 W.
What is wrong with the technician's measurement? The resistance measurement is too high (it should be closer to 0.1 W) because the ohmmeter was not properly set up to compensate for test lead resistance. Analog ohmmeters had to be "zeroed" prior to almost every measurement out of necessity, to give accurate measurements despite changes in internal battery voltage. Modern digital ohmmeters do not have this problem, but the lack of a "zeroing" procedure can lead to errors due to uncompensated test lead resistance. Your students should research the proper use of their own digital meters in this regard. Having forgotten the resistor color code, and being too lazy to research the color code in a book, the technician decides to simply measure its resistance with an ohmmeter. 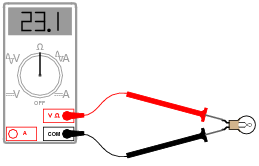 Holding one lead of the resistor and one test lead of the ohmmeter between the thumb and index finger of the left hand, and the other resistor lead and meter test lead between the thumb and index finger of the right hand (to keep each test lead of the meter in firm contact with the respective leads of the resistor), the technician obtains a resistance measurement of 1.5 MW. The resistance measurement is much too low (it should be closer to 39 MW) because the technician's body resistance is in parallel with the resistor. This is a very common mistake made by beginning students of electronics: holding resistors improperly when measuring their resistance values. Discuss with your students some alternative methods of maintaining resistor lead contact with the meter probes so that the person's body does not become part of the resistance being measured. What is a megger, and what type of resistance measurements would it typically be used for? Explain how the design of a "megger" differs from that of a normal ohmmeter. Also, explain how improper use of a "megger" may actually be hazardous, either to the operator of the meter or to the circuit under test. A "megger" is a high-range ohmmeter, typically used to measure the resistance of wire insulation. They utilize relatively high voltage (upwards of 1000 VDC) to measure resistance. Follow-up question: what is a hi-pot meter, and what function is it typically used for? Challenge question: why are special, high-voltage ohmmeters even needed? What's wrong with using a regular ohmmeter that outputs just a few volts to measure resistance? What does the existence of these specialized ohmmeter types tell us about the nature of electrical resistance? "Meggers" are very useful tools, but they can cause damage as well. Your students need to be aware of proper and improper uses of "meggers" before they are entrusted with the use of one. The challenge question is worth exploring if time permits! In real life, the simplicity of Ohm's Law is deceptive . . .
High-precision ohmmeters use a four-wire electrical connection to the resistance under test, rather than a two-wire connection. Explain how the four-wire system works, and why it provides better accuracy than two-wire resistance measurement. Two-wire ohmmeters measure not only the resistance under test, but also the added resistance of their own test leads. Four-wire ohmmeters only measure the resistance under test. It is one thing to explain how four-wire resistance measurement works, but another to describe how you would set up your own four-wire ("Kelvin") resistance measurement system using normal two-wire meters. Challenge your students with this problem, to test their comprehension of the concept. Some ohmmeters have a range where the measurement is expressed in units of siemens (usually microsiemens, or mS). What is a ßiemens," and how does it relate to the unit of the öhm"? Challenge question: what was the old unit for conductance, prior to the siemens? You will find it makes more sense than siemens, just as the old metric unit of temperature ("centigrade") makes more sense than the new unit (celsius). Ask your students, ïs 1 microsiemens equivalent to a large resistance or a small resistance?" Have them explain their answer, without using a calculator.